Can Seth Godin rework the nuggeting trend? If you read this blog recently, you know that I liked the book Rework. One thing that troubles me, though, is the trend of nuggeting—in publishing and presentations. Nuggeting – the act of breaking down information into small, easily digestible nuggets. I recently attended a webinar given by Seth Godin, and I kind of hated it. Well, hate’s a strong word. I just didn’t like it. I am a big fan of Seth’s blog and of his work in general, but I expected more from the presentation than nuggets. The whole thing was just tidbits from Seth’s head. Post on weekdays because there are more readers. Post on weekends because there are fewer new posts. Really? I could’ve come up with the same things. But people were eating it up, as far as I could tell. I was reading Rework the same week in which I attended Seth’s webinar. I loved the book, I didn’t like the webinar. Why? Maybe I was just disappointed. Seth’s webinar was titled “57 Ways to Connect With Customers and Get Them to Spread Your Ideas for You.” I expected it to be more business and marketing oriented. Maybe if it was titled differently (like “A Bunch of Ways to Boost Your Blog”), I would’ve liked it more. Also, the webinar was given through MarketingProfs—an organization that puts on fantastic webinars and offers up a ton of interesting and valuable content. I know some readers didn’t like Rework because they felt they could find the same info on the authors’ blog Signal vs. Noise. Maybe I liked the book because I hadn’t read their blog. An awful lot of people are selling books and webinars these days, especially some of the top names in marketing and social media. Many of these people seem to sneak by with a Twitter-like version of things. Often I think this is due to demand and time constraints. But sometimes, I see something that makes me wonder, is that person thinking: People love me, they know I’m an expert. I can put out anything and they’ll buy it (both literally and figuratively). In the Philadelphia area, there is this very successful businessman who talks about “charging like a rhino.” He’s very smart, well-respected and knows what he’s doing, so I ordered his book…ahem, booklet. On the first page, he bragged that he wrote the book in 4 or 5 days. Red flag! Even if he hadn’t admitted that, I would’ve figured it out within the first 25 pages or so. I do understand his intention. He started out writing things down to help his daughter, and decided more people could benefit from his advice. I totally respect that. But, here’s where he went wrong: He could’ve written things for his daughter in 4 days, and that would’ve been fine. But if he or anyone wants to write for a larger audience, we really have to put more time into it than that. Your audience deserves your very best. Period. I don’t think nuggeting is wrong (because it definitely has its place). But put yourself in your audience’s shoes. Before you publish that book or give that presentation, ask yourself, are you giving them your very best? Are you giving them what they need? Make sure you help them set up their expectations so that they expect exactly what you’re going to present. Don’t choose being clever over being authentic. It’s worth saying again: Your audience deserves your very best. Seth Godin is usually a fabulous presenter, and he deserves his stellar reputation. Here’s proof from the 99% conference—on lizard brains and thrashing. This appears on the inside cover of Rework, by Jason Fried and David Heinemeier Hansson. Consider it fair warning. The outside cover also gives you a good idea of what type of book this is. On the front is a blurb provided by Seth Godin, the master of pithy observations. On the back (as you can see pictured here), are some of their catchy chapter titles. All of these clues are very important because whether you enjoy the book depends on your expectations. Some readers are not okay with this (see Amazon reviews), and I had to ask myself why I am. My answer was, again, expectations. The back cover is what set me on the right path. I saw those short statements and immediately agreed with some of them, which made me figure I’d like what they had to say. And it made me curious about the others. I’m a big fan of common sense, and many of their precepts are exactly that. Stop saying ASAP. We get it. It’s implied. Everyone wants things done as soon as they can be done…when everything is high priority, nothing is. The worst interruptions of all are meetings…the true cost of meetings is staggering. Let’s say you’re going to schedule a meeting that lasts one hour, and you invite ten people…You’re trading ten hours of productivity for one hour of meeting time. There are many nuggets of wisdom like this in Rework, and that’s why I recommend you read it. Everyone should regularly rethink the way they work. And this book definitely gives you a strong outside perspective to consider. However, Rework is not “the perfect playbook for anyone who’s ever dreamed of doing it on their own,” as it says on the inside cover. Though the authors give some great information in limited space, they don’t give step-by-step instruction or go into much depth. I would call Rework a quick, even entertaining read, with some smart perspectives to help you rethink the way you work. And I would love to see a follow-up book by Fried and Hansson that does go deeper. If you do read Rework or have already read it, let me know what you think. The authors also have a top-rated blog you can check out: Signal vs. Noise. Like many women, I am offended by Swiffer’s latest ad. Not because it’s sexist, but because it’s stupid. C’mon ladies, why are you even watching Swiffer commercials anymore? Didn’t the supposed former love affair with the broom kind of say it all? If this is the first Swiffer commercial you think stereotypes women, you haven’t been paying attention. If you want to be offended, be offended because it’s bad advertising. Swiffer obviously doesn’t understand its target audience. But Chevy does. Their “Guys Night” ad is perhaps one of the best commercials for women. Have you seen it yet? I feel like I don’t even have to explain it. Starts off with a good-looking guy trying to erase any evidence of a baby in his car. He makes sure his wife is okay and even thanks her for letting him go on his guys night. Then when he pulls away with his buddies, his friend hits the CD player and baby music comes on. That smile at the end says this guy is completely comfortable being a father, even if his buddies end up making fun of him later. What is more attractive to women than that? Well, how about a man who takes a Swiffer WetJet out of a woman’s hand and says, “Please, allow me”…and hands her a glass of wine…and takes his shirt off…and…oh, wait, sorry. Got a little distracted there. My point is, Swiffer, women love your products but not your campaign. Pay more attention to what women respond to. Um, you might want to start with the comments on your Facebook page. Ok, Swiffer, I don’t know why I’m doing your work for you, but I found another story you can use to figure out how to advertise to your audience. Check out the Mommin’ It Up blog. Resolving to do something different isn’t just a year-end activity. It should be an everyday thing or an every week thing or an as-needed event. If something is not going well, why wait to resolve to change your ways? Decide on the best steps to take to succeed. Sounds easy, I know. But these three simple steps are the key to change in your business life and personal life. E-mail marketing is a great example of why you shouldn’t wait. You send out e-mails and you get a very low response rate. What do you do? Do you wait until next year to change things? No. You don’t even wait until next week to change things. You review the analytics and test and try and figure out what the problem is. Based on your findings, you decide what changes to make. You make the changes and try again. Technology of today allows us to react much more quickly to all sorts of business problems. Gathering needed information takes hours or days instead of weeks and months. You almost have no excuse not to react quickly. The same is true in your personal life. One of the most popular New Year’s resolutions is to lose weight. Why do so many people get off track? Because they get stuck on step one. They don’t take time to figure out why they’re overweight. Eating too much is often the symptom, not the problem. Resources are at your fingertips. Call your doctor or go online to the thousands of sites that focus on weight loss and better health. The details are different for each person and each problem. In fact, the details could be quite complex in some cases, but the steps you must take to change are still simple. Figure out why you are overweight. List steps you can take to change. Start following the steps. You might need help figuring out the real source of the problem—in personal problems and business problems. So, if you insist on making a new year’s resolution, resolve to surround yourself with good support teams—in both worlds. 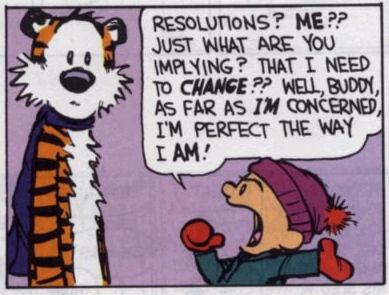 And resolve to make resolutions more frequently.